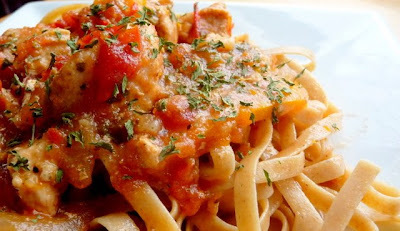 This is an easy, fun pasta dish if you are looking for something different. This was actually the first meal I cooked after I recovered from PRK eye surgery - once I was finally able to see something - it was nice to be able to cook again! I'm still recovering from the surgery- but it is amazing to be able to see without contacts/glasses anymore! Enjoy! 1. Cook pasta according to package directions. Drain when pasta is still al dente. 2. Sprinkle 1 1/2 teaspoons Cajun spice over chicken pieces. Toss around to coat. 3. Heat 1 tablespoon oil and 1 tablespoon butter in a heavy skillet over high heat. Add half the chicken in a single layer; do not stir. Allow chicken to brown on one side, about 1 minute. Flip to the other side and cook an additional minute. Remove with a slotted spoon and place on a clean plate. Repeat with remaining chicken. Remove chicken, leaving pan on high heat. 4. Add remaining olive oil and butter. When heated, add peppers, onions, and garlic. Sprinkle on remaining Cajun spice, and add salt if needed. Cook over very high heat for 1 minute, stirring gently and trying to get the vegetables as dark/black as possible. 5. Add tomatoes and cook for an additional 30 seconds. Remove all vegetables from the pan. 6. With the pan over high heat, pour in the wine and chicken broth. Cook on high for 3 to 5 minutes, scraping the bottom of the pan to deglaze. Taste and add freshly ground black pepper, cayenne pepper, and/or salt to taste. 7. Finally, add chicken and vegetables to sauce, making sure to include all the juices that have drained onto the plate. Stir and cook for 1 to 2 minutes, until mixture is bubbly and hot. 8. Add drained fettuccine and toss to combine. 9. Top with chopped fresh parsley. Mmmm this is one of my favorite foods ever! This is actually on my menu for Friday! Looks delicious! Curiously enough I am making Cajun Chicken past tonight!